Polyurethane floor finishes have been the general standard for floors in the United States for decades so it may come as a surprise to many home and business owners to learn that there is an alternative. Hard Wax Oils, also known as Repairable Floor Finishes are penetrating oils that literally absorb into the wood fibers to protect the floor from within, while polyurethane products on the other hand are designed to coat the floor with a protective lacquer. One of the many benefits of hard wax flooring is its ability to be easily repaired without the expense and inconvenience of refinishing the entire floor. The knowledgeable professionals at Mike’s Custom Flooring are the experts when it comes to repairable floor finishes including Osmo Polyx Oil and Rubio Monocoat Oil. Imported from Germany, the finish is created from a blend of both natural plant oils and waxes that once set are highly water resistant. The product is environmentally friendly with low VOC’s (volatile organic compounds). 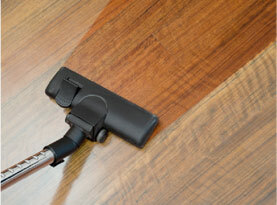 Osmo polyx oils are easy to care for and maintain and unlike polyurethane finishes, they will not form a plastic film. The product is safe for use on benchtops, food preparation areas and children’s toys. 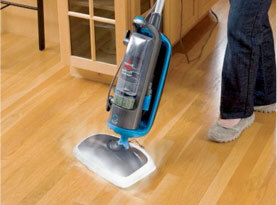 There is no odor and it can be used in both domestic and commercial applications. Osmo polyx oil is designed to enhance the natural beauty of your wood floor by binding to the wood to amplify the original appearance of the wood grain. It will not blister, flake or peel and any damage can be spot repaired quickly. 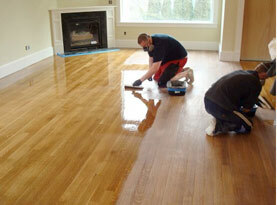 With Osmo polyx oil you get the beauty of a traditional oil finish with the durability of polyurethane. 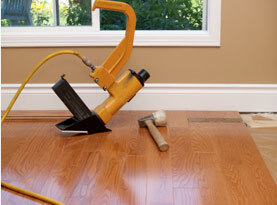 As the product is professionally applied to your hardwood flooring, the oils penetrate deep into the wood pores to protect the wood from the inside out. The resulting finish is both water resistant and long lasting and designed to resist cracking, flaking, peeling and blistering associated with more conventional floor finishes. Imported from Belgium, the finish is created from natural plant oils and is considered one of the most environmentally friendly hard wax products available with absolutely zero VOC’s. The product requires only one application, is easy to care for and maintain and is available in more than 30 colors that are designed to blend perfectly in any style home. The product contains only non-toxic ingredients so it is one of the safest products available for use in your home. Rubio monocoat oil does not form a hard shell like polyurethane finishes but it is durable enough to be used in both residential homes and commercial businesses. The product is designed to enhance the beauty of the natural wood grain and bonds to the wood so it will no blister, peel or flake and any damage can be easily repaired without compromising the entire floor. With rubio monocoat, you get the best or both world’s – the beautiful appearance of a traditional oil finish with the durability of polyurethane. As the oil is applied it will bond to the wood to create a matte surface with an incredibly strong protective outer coating leaving a finish that is resistance to spills, flaking, peeling, cracking and blistering. For more information regarding the application of hard wax oil products on the floors in your home or business, contact the professionals at Mike’s Custom Flooring today.